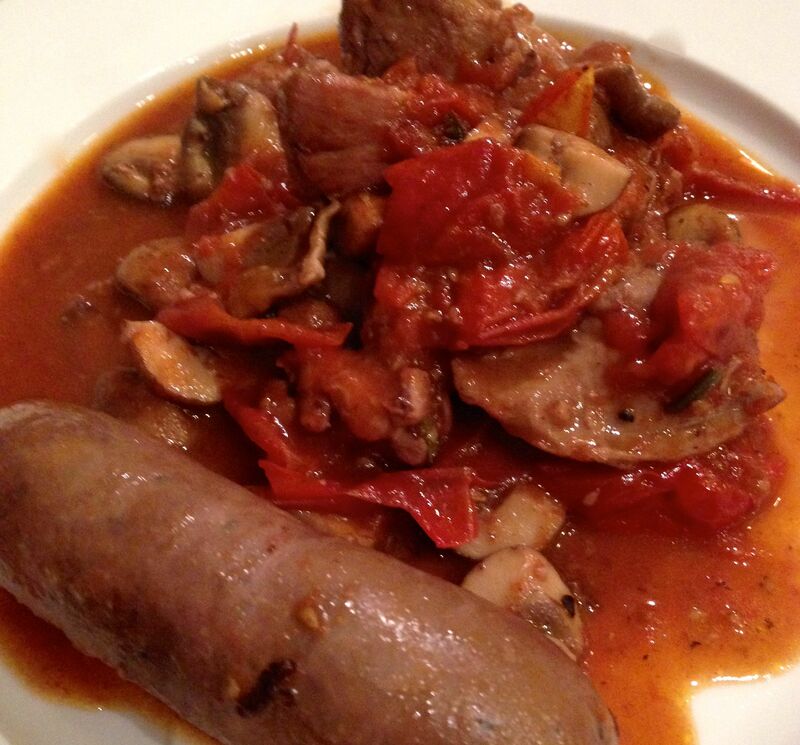 Here’s a quick cacciatore with chicken and sausages. It was delicious and perfect for a cold, snowy night. Despite the two pints of grape tomatoes, the tomato flavor was not dominant. Some reviewers of the recipe mentioned adding tomato paste. If you want more tomato flavor, try this. But I really enjoyed the earthiness from the mushrooms and red wine. The store was out of skin-on, bone-in thighs so I used skinless, boneless. If you make this change, add the chicken and sausages back to the pot at the same time. We mopped up the delicious sauce with some crusty bread. Heat 2 tablespoons oil in large nonstick skillet over medium-high heat. Sprinkle chicken with salt and pepper. Add chicken and sausages to skillet. Sauté until brown, 4 to 5 minutes per side. Transfer chicken and sausages to bowl. Add mushrooms to skillet. Sauté until brown, about 4 minutes; add to same bowl. Add remaining 1 tablespoon oil to skillet; add tomatoes, red wine, garlic, and rosemary. Cover, reduce heat to medium, and cook until tomatoes soften, about 5 minutes. Using potato masher, lightly crush half of tomatoes. Return chicken to skillet. Reduce heat to medium-low. Simmer uncovered 5 minutes. Add remaining contents of bowl and simmer uncovered until chicken and sausages are cooked through, turning often, about 15 minutes longer. This is an easy homemade mac and cheese that will please kids and adults! Tasty with the added benefit of a bit of broccoli in the dish. I followed the recipe as written, using a mild cheddar. The only addition was including a bit of parmesan to the cheddar sprinkled on top. Heat broiler. Cook the pasta according to the package directions. Drain. Meanwhile, heat the butter in a large pot over medium heat. Add the flour and cook, stirring, for 2 minutes. Whisk in the milk and cook, stirring occasionally, until slightly thickened, 4 to 5 minutes. Add 1 ½ cups of the cheese and stir until melted. Stir in the nutmeg, ¾ teaspoon salt, and ¼ teaspoon pepper. 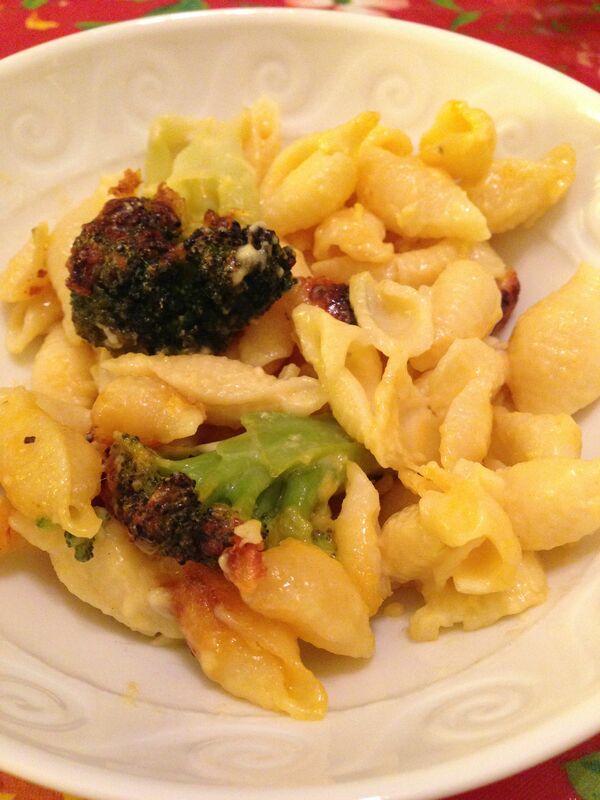 Add the pasta and broccoli and toss to combine. Transfer to a broilerproof 8-inch square or a 1 ½-quart baking dish. Sprinkle with the remaining ½ cup of cheese. Broil until golden, 3 to 4 minutes. Who doesn’t love braised meat on a cold day! But doesn’t braising take hours? 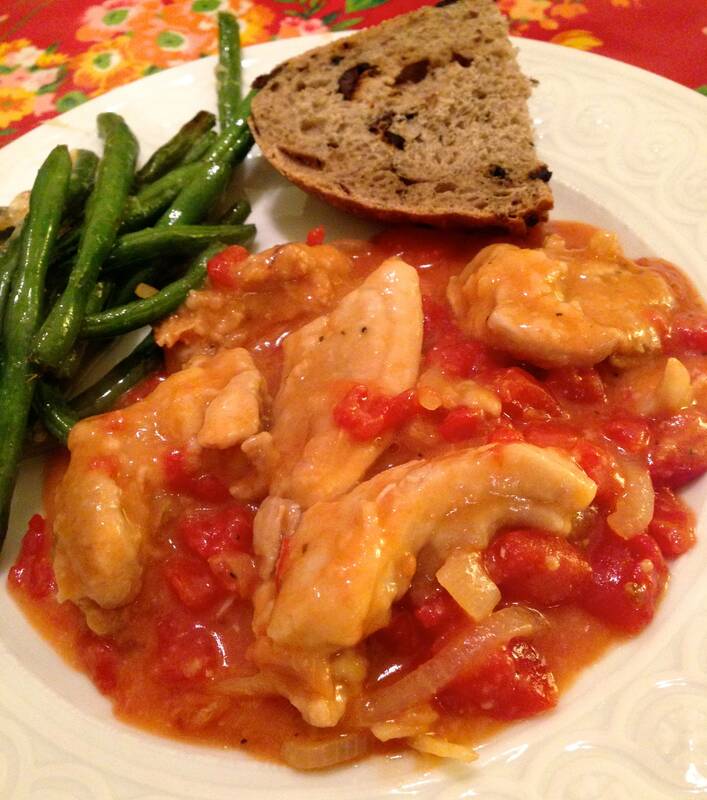 Here is a very tasty weeknight braised chicken dish. The red wine vinegar and tomatoes create a delicious piquant sauce. You’ll want plenty of bread to dip in the sauce. Put the flour, 1 tsp. salt, and 1/2 tsp. pepper in a 1-gallon plastic zip-top bag. Close and shake to combine. Add the chicken to the bag, zip it closed, and shake vigorously to coat with flour. Heat 2 Tbs. of the oil in a 12-inch skillet(preferably cast iron) over medium-high heat until shimmering hot. Add half of the chicken in a single layer and cook, flipping once, until golden, 2 to 3 minutes per side. Transfer the chicken to a large bowl. Add the remaining 1 Tbs. oil to the pan and repeat with the remaining chicken. Add the onion to the pan and cook, stirring, until slightly softened, about 2 minutes. Add the garlic and cook 30 seconds more. Stir in the tomatoes and bay leaf, raise the heat to high, and cook until the tomatoes begin to break down, about 2 minutes. Add the vinegar and boil vigorously until almost evaporated, about 30 seconds. Return the chicken and any accumulated juice to the pan, along with the chicken broth, 1/2 tsp. salt, and 1/2 tsp. pepper, stirring well to combine. Bring to a boil; then reduce the heat to maintain a simmer. Cook, partially covered, stirring occasionally, until the chicken is cooked through, about 8 minutes. Stir in the parsley, cover, and cook for 1 minute more. Season to taste with salt. Remove the bay leaf and serve. I haven’t really been posting because some other things have been keeping me busy. BUT I have been cooking. 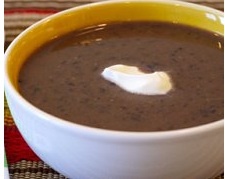 This week I made this super easy and delicious black bean soup in my slow cooker. I just had to post it because everyone — me, Tim, and 3.5 year old Charlotte — loved it and it is pretty rare to get a dish that is such a hit for all three of us. I followed the recipe as written using veggie stock. After 9 hours on low, I used my immersion blender to puree the soup a bit. It really couldn’t have been easier! The soup was dinner one night and lunch the next. 1. Heat oil in a sauté pan over medium heat and sauté onions for 4 minutes. 2. Add chopped garlic and sauté an additional minute. 3. Place the onion garlic mixture into the crock pot along with the rest of the ingredients and stir to combine. 4. Cook on low for 8-10 hours. 5. Using either a hand blender or traditional blender, puree the ingredients to your desired texture (I like to get it so a few pieces of beans are still visible so the soup is thick and still has a bit of texture). 6. Top with a dollop of yogurt, sour cream or crème fraiche. After making some less than stellar chicken thighs, I was on the quest for a better technique. This recipe was easy and delicious!! In addition to the salt and pepper, I added a touch of Italian seasoning. But other than that, I followed the recipe exactly and the chicken was moist and the skin was crsipy. YUM! Preheat oven to 475°F. Season chicken with salt and pepper. Heat oil in a 12″ cast-iron or heavy nonstick skillet over high heat until hot but not smoking. 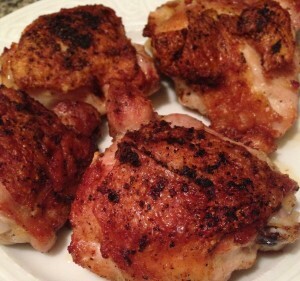 Nestle chicken in skillet, skin side down, and cook 2 minutes. 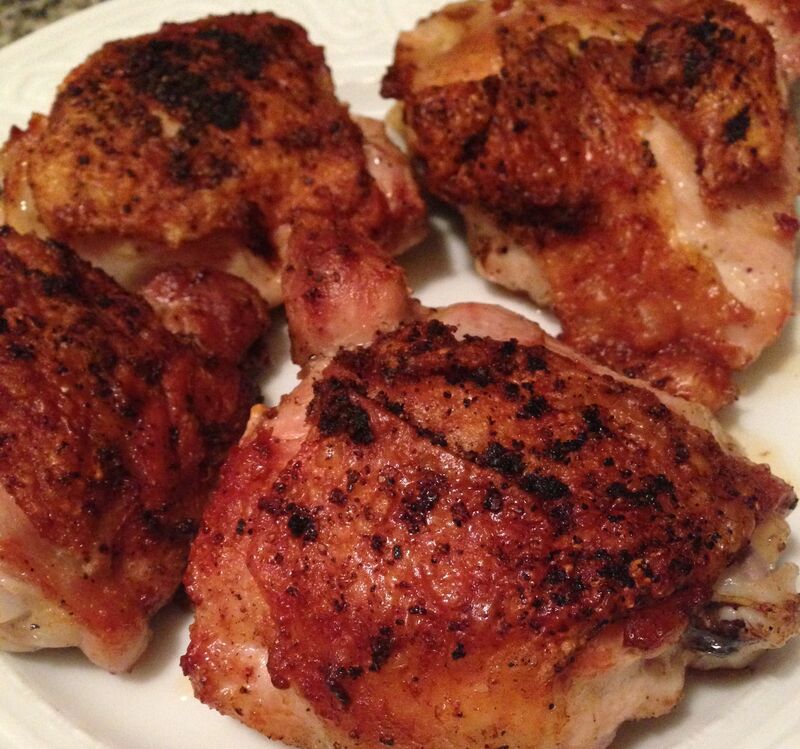 Reduce heat to medium-high; continue cooking skin side down, occasionally rearranging chicken thighs and rotating pan to evenly distribute heat, until fat renders and skin is golden brown, about 12 minutes. 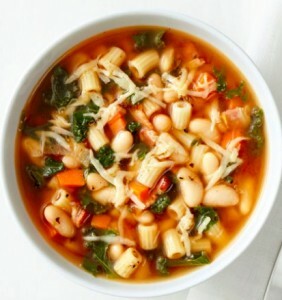 Here is a delicious fall soup recipe I made last week. It was super tasty — great smoky flavor from bacon and the parmesan, tomato, kale, and white beans are a great combo. I made a couple of small modifications. I didn’t have a parmesan rind so I omitted it. And instead of ditalini I used mini raviolis. Also subbed fresh kale for frozen. Charlotte and I both gobbled it up. Put the bacon in a large pot or Dutch oven over medium heat and cook, stirring occasionally, until crisp, about 4 minutes. Add the onion and cook, stirring occasionally, until slightly softened, about 3 minutes. Add the carrots, garlic, tomato paste, thyme and 1/2 teaspoon each salt and pepper and cook until the carrots begin to soften, about 2 minutes. Add the chicken broth, 6 cups water and the parmesan rind. Increase the heat to high; cover and bring to a boil. Add the pasta and beans and cook, uncovered, 5 minutes. Reduce the heat to medium and add the kale. Simmer, uncovered, until slightly thickened, about 7 minutes. Remove the parmesan rind, stir in half of the grated cheese and season with salt and pepper. Ladle into bowls and top with the remaining cheese. I’ve made this wonderful and quick Bolognese from the Barefoot Contessa before. 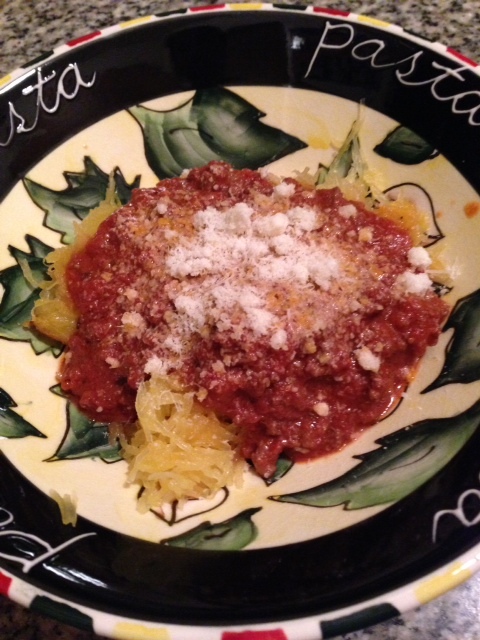 But in an attempt to be lighter on carbs, served it over spaghetti squash on Monday night. I love pasta and nothing will ever truly be a substitute but this was a pretty delicious meal! Spaghetti squash is so easy to prepare and pairs wonderfully with a tomato-based sauce. Will definitely be moving this into our fall / winter meal rotation. Preheat the oven to 450 degrees F.Split the squashes in half and scrape out seeds. Line an oven tray with aluminum foil. Season the spaghetti squash with olive oil, salt, and pepper. Place flesh side down and roast for 30 to 40 minutes until fully cooked. Remove from the oven and let rest until cool enough to handle.When squash is cool enough to handle, using a large kitchen spoon scrape the strands of squash from the inside of the skin. After the decadent meal of Orecchiette Carbonara with Charred Brussels Sprouts, I decided to make a lighter dinner last night. For the fish, the recipe recommends tilapia or catfish filets. You simply season the filets with salt and pepper and cook in a frying pan with a touch of olive oil. Top the fish with some panko you toast in the oven. The panko adds a nice crunch and a bit more flavor. The steamed green beans are tossed with green olives, whole grain mustard, olive oil, and salt & pepper. Great combination — especially for us with our olive-loving little girl. Overall a healthy and delicious dinner that only took about 20 minutes to put together! Heat oven to 350° F. Toss the bread crumbs, butter, and ¼ teaspoon each salt and pepper on a rimmed baking sheet. Bake, tossing once, until golden brown, 4 to 6 minutes. Let cool, then toss with the parsley. Meanwhile, steam the green beans in 1 inch of water until tender, 3 to 5 minutes; drain. Transfer to a large bowl and toss with the olives, mustard, 1 tablespoon of the oil, and ¼ teaspoon each salt and pepper. Heat the remaining tablespoon of oil in a large nonstick skillet over medium-high heat. Season the tilapia with ¼ teaspoon each salt and pepper and cook, in 2 batches, until opaque throughout, 2 to 3 minutes per side. 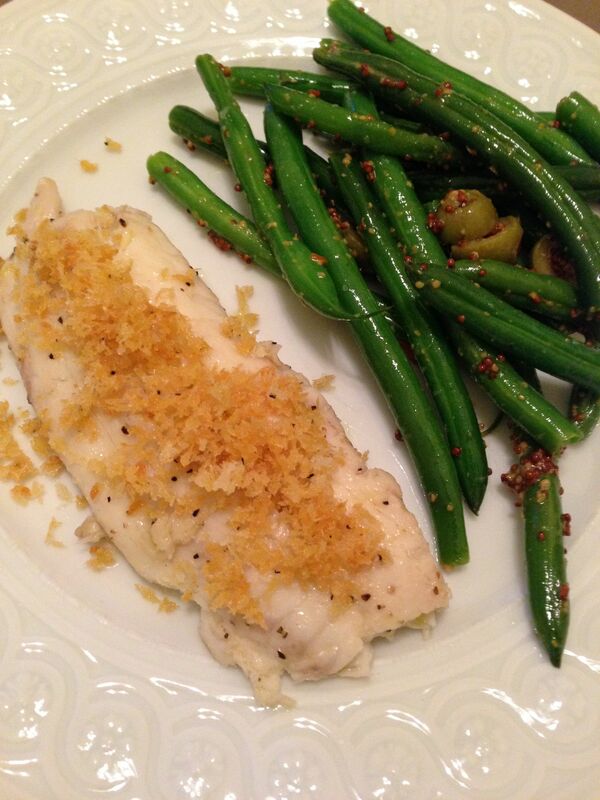 Serve the tilapia sprinkled with the bread crumbs, with the green beans and lemon wedges on the side. After making my first disappointing Barefoot Contessa dish on Saturday, I was very happy to make a super tasty dinner tonight! 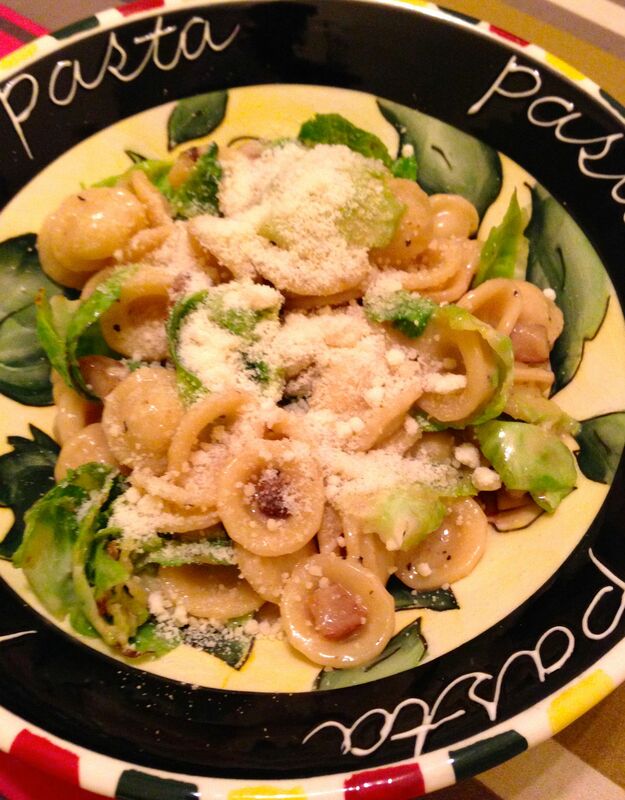 The recipe is a variation on a carbonara with the delicious addition of Brussels sprouts and lots of Pecorino. Not many notes on this recipe. I was able to buy some guanciale (un-smoked Italian bacon usually prepared with pig’s cheeks) at Dickson’s Farmstand, an amazing butcher in Chelsea Market. I’m sure the recipe would be great with pancetta as well. I only needed about 1/2 cup of the reserved pasta water. I aslo added a pinch of kosher salt when I mixed in the Brussels sprouts. Tim and both cleared our plates (and then some). Heat 1 tablespoon oil in a large skillet over high heat. Working in batches, add Brussels sprout leaves and cook, tossing occasionally, until charred in spots and crisp-tender, about 5 minutes; transfer to a plate and set aside. Wipe out skillet. Cook pasta in a large pot of boiling salted water, stirring occasionally, until al dente (about 5 minutes for fresh pasta). Drain, reserving 1 cup pasta cooking liquid. Add pasta to skillet and toss to coat. Add Pecorino; toss to combine. Remove from heat; mix in egg yolks. Add reserved Brussels sprout leaves; toss, adding pasta cooking liquid (or hot water) as needed to thin sauce. Serve pasta topped with more Pecorino. When I started this blog back in 2009 (holy sh%t it’s been that long! ), I said I would post the winners and the losers. This dish wasn’t a loser but it didn’t come together as I had hoped. The sauce didn’t thicken as described in the recipe. The chicken was flavorful and packed a bit of heat from the cayenne and paprika. But the sauce was disappointing. I find far more winners than disappointments but it is annoying after a long day to cook a dinner you are not thrilled with. Oh well…onto the next recipe! Mix cumin, paprika, salt, and cayenne in small bowl. Cut chicken crosswise into thirds. Toss in large bowl with spices. Heat 1 tablespoon oil in large skillet over medium-high heat. Add chicken; brown 2 minutes per side. Transfer to plate. Add 1 tablespoon oil and fennel to same skillet. Sauté until golden in spots, 5 minutes. 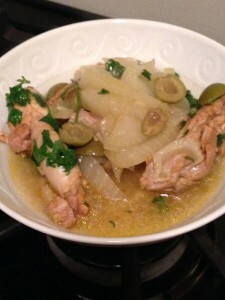 Return chicken and juices to skillet. Add broth and lemon juice. Bring to simmer, scraping up browned bits. Cover, reduce heat to low, and cook until chicken is cooked through, 15 minutes. Add olives. Simmer until sauce thickens, 5 minutes. Stir in cilantro. Season with salt and pepper.